The pace of ITS technology deployment in Canada is increasing steadily. The Canadian Government, under the $2.1 billion Gateways and Border Crossings Fund (GBCF) programme, has allocated $400 million for the construction of new access roads, equipped with state-of-the-art ITS technologies for surveillance, real-time traveller information, fully-automated border clearance and commercial vehicle operation system technologies. While forecasting parking demand, it is important to perform follow-up surveys over time to understand how the demand changes over time. The authors bring over 45 years of combined experience in transport planning to explain how parking demand can be assessed and how this demand can be managed, with specific reference to experience in Hong Kong and China. Effective Lane Marking can successfully increase the thruput of vehicles. Hence, it is advisable to invest in durable, luminous and bright paint of high quality. Florida, which now moves into rail transit, faces the challenge of getting the residents to ride the trains as its population is heavily dependent on personal automobiles for travel. For the “buy-in” to happen, it has to provide the overall “rider experience” that is a step up from their current mobility options. PPP in Highways: Can they be the road to success? The first technologically advanced acoustic barriers are being installed along Bandra-Kurla Link Road (BKLR), Mumbai by the “Fracasso” Group. The Group, a leading manufacturer of noise barriers and W beam crash barriers, is now in the process of introducing crash tested barriers and corrugated steel culverts in India. The adoption of faster modes of transport has changed profoundly the spatial organisation of cities. The increase in average speed of a city's transport system calls for more space. The result is urban sprawl and reduced density. Dominant transport modes are, therefore, the determinants of urban structures. 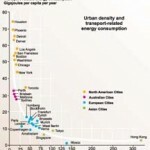 The increase in distance covered due to increased speed of travel and urban sprawl leads to an increase in energy consumption.